A staple in crawfish boils and popular dishes like shrimp and grits, Andouille sausage is a great addition to just about any entrée or side dish. Premio Andouille has the perfect blend of smoked pork sausage, garlic and Cajun seasoning. Whether it’s served as an entrée or incorporated into another dish, our andouille has a distinct taste that will keep everyone at the table until the last bite is gone. Order Premio Andouille today. Ingredients: Pork, Less than 2% of the following: Water, Salt, Sugar, Spices, Potassium Chloride, Onion Powder, Garlic Powder, Dehydrated Parsley, Natural Flavors, Red Bell Pepper Powder. If you have never tasted an andouille sausage, your taste buds are in for a treat. This sausage originated in France, but it truly gained popularity in the United States among the Creole and Cajun cultures, which enthusiastically welcomed the spicy pork sausage to their extensive culinary lineups. Smoking the sausage creates the distinctive taste, enhanced by the addition of Louisiana staples such as peppers and onions. The seasonings bring out the unique qualities of the sausage. Where will you find andouille sausage? It remains a staple in gumbo, a traditional southern dish, but it can also be added to a variety of dishes to give them more spice. Variations on mac ‘n cheese, stews, casseroles and soups all include andouille. Premio andouille is among the world-class sausages we offer to our customers. We recognize the many great qualities of andouille, which provides a hefty dose of protein with every serving. For those looking to cook healthier meals, a small amount of andouille sausage goes a long way, meaning you can use a small bit to keep a dish low in fat but full of flavor. The best food comes with a short ingredient list. We believe in offering sausage that’s minimally processed and made with fresh ingredients. We pledge we will not use fillers to artificially plump your sausage. Are you or someone you love on a gluten-free diet? You can eat our andouille sausage without fear. It’s naturally gluten-free, as well as free of MSG. Wondering how to cook andouille sausage? Browse our recipes page for a full complement of dishes using this type of sausage. You can find options for lunch, dinner and even breakfast. Going to tailgate at a big game? You can even prepare a dip using andouille. 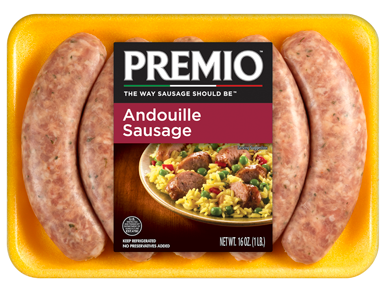 Whatever the occasion, andouille sausage from Premio Foods makes an ideal addition to the lineup. Even many picky eaters like sausage, and you may find them asking you where you found this delicious variety. Feel free to direct them to us! Want to know the secret of running a successful family-focused business for more than four decades? Our No. 1 priority is high quality. Whether it’s in our customer service, the food we produce, or the way we go about setting long-term company goals, quality remains at the top of our mind. Part of that quality, we believe, is being a community leader dedicated to making things better for everyone around us. That’s why we give back through food banks and donations to worthy causes. Quality also means looking out for our customers in unexpected ways. That includes regular promotions, deals and coupons letting you save money on our products. It also includes having fun on social media interacting with our customers — we love hearing about your latest andouille sausage and other recipes, so come find us. And stock up on supplies for those recipes through or website or by finding a store near you that sells Premio Foods products.